Mangaluru, July 28, 2015: The citizens of Mangaluru and in fact people every where from all walks of life and children and youth are sure to feel the death of former Indian President A.P.J. Abdul Kalam, who passed away July 27 pm. Most people recall his last visit to Mangaluru in 2014. Earlier, he had visited the city on February 25, 2009; as the President, he had visited St. Aloysius College on March 28, 2003. The District Systematic Voters’ Education and Electoral Participation (SVEEP) Committee invited him and he had come to the city on April 1, 2014 and addressed students at the TMA Pai International Convention Centre. he told the students Mangaluru is a beautiful and vibrant place and that they had a greater role to play in making Mangaluru the cleanest and best place. 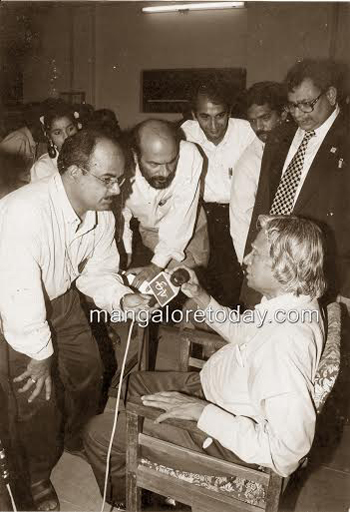 late A P J recalling his links to Mangaluru said that when he was a student at the Madras Institute of Technology in 1954, the student, who sat along with was Mahabaleshwar Bhat from Mangalore. He advised students to have a great dreams, acquire knowledge consistently, work hard and not to be afraid of life but overcome them with wit. A leader should not be afraid of problems. Former Prez Kalam asked students to elect the best and honest candidates. After his tenure as the President of India, he had addressed students and others on the topic “Me and my society” at the Corporation Bank head office at Pandeshwar on February 25, 2009. The talk had been organised by the DK district administration. Earlier as the President of India he had inaugurated the Information Technology, Research and Management Centre of St. Aloysius College on March 28, 2003. Many have fond memories of him here. His sudden death in Shillong doing what he liked best, giving a talk on the evening of July 27, 2015, he collapsed on the dais and was rushed to hospital where he passed on. May this great soul rest in peace. the nation and most of the world are mourning the loss of a great man. In December 2001 (shortly before becoming the President), APJ visited Mangalore to inaugurate the XVII National Conference on IC Engines Combustion at KREC. This was followed by an interactive session with the children of KREC English Medium School as part of his famous mission to reach 1 lakh school kids. Though I woke up unusually early and tailed him from 7.00 a.m., I was unable to get a one-on-one dream interview with him. But the experience of watching him interact with the kids was hair raising and I shall never forget it. Mr.Kalam’s is a Model Personality.He is loved and respected by all. Mr.Kalam’s visit to our city is a memorable one. We are very sad , we have lost a great leader ,a teacher, a scientist......He is remembered by all. Rest in Peace. We are very sad that we have lost a great personality. He is a icon in the minds of every Indian.